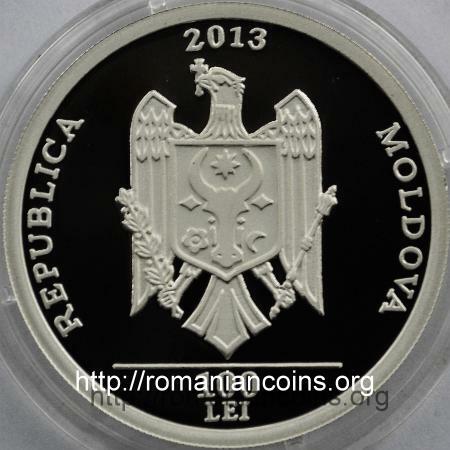 year 2013, circular inscription REPUBLICA MOLDOVA meaning "REPUBLIC OF MOLDAVIA" and the coat of arms of the Republic of Moldavia, in exergue horizontal line and denomination "100 LEI" Trajan's Column, inscription "1900 DE ANI DE LA INAUGURAREA COLUMNEI LUI TRAIAN" meaning "1900 YEARS SINCE THE INAUGURATION OF TRAJAN'S COLUMN"
Trajan's Column also appears on two Romanian gold coins: 1000 lei 2001 - 1900 years since the first Dacian-Roman war - and 100 lei 2013 - Trajan's Column - 1900 Years. 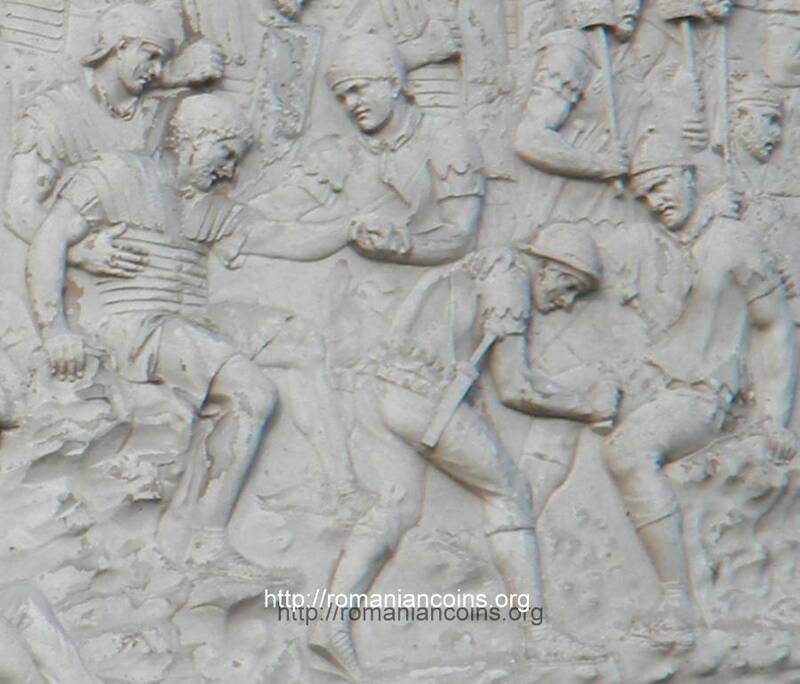 A fight scene between Dacians and Romans, inspired by the bas-reliefs of the Column, appears on the 50 lei silver 1983 and 500 lei gold 1982 and 1983 - 2050 years since the creation of the centralized and independent Dacian state. 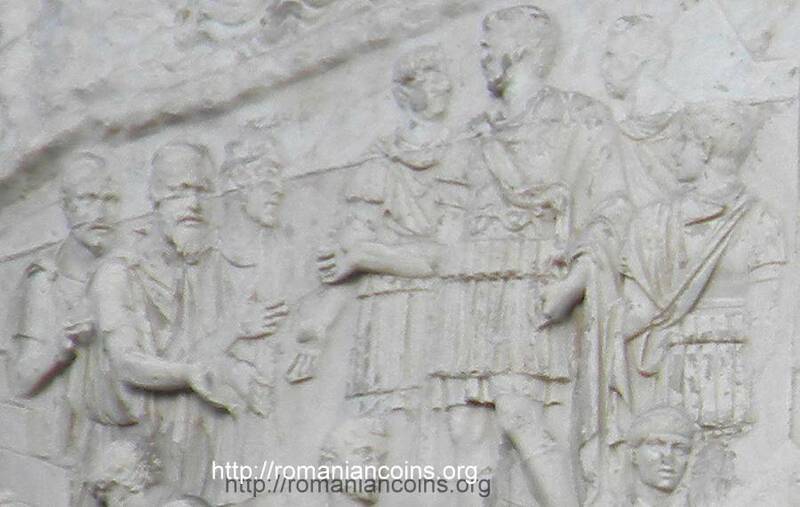 A replica of an aureus of emperor Trajan was issued by the NBR in 2006 to mark 1900 years from the Dacia's conquest by the Romans, from the organization of the imperial province of Dacia and from the beginning of the Dacia's Romanization and of the Latinizing of the Carpathian-Danubian space. 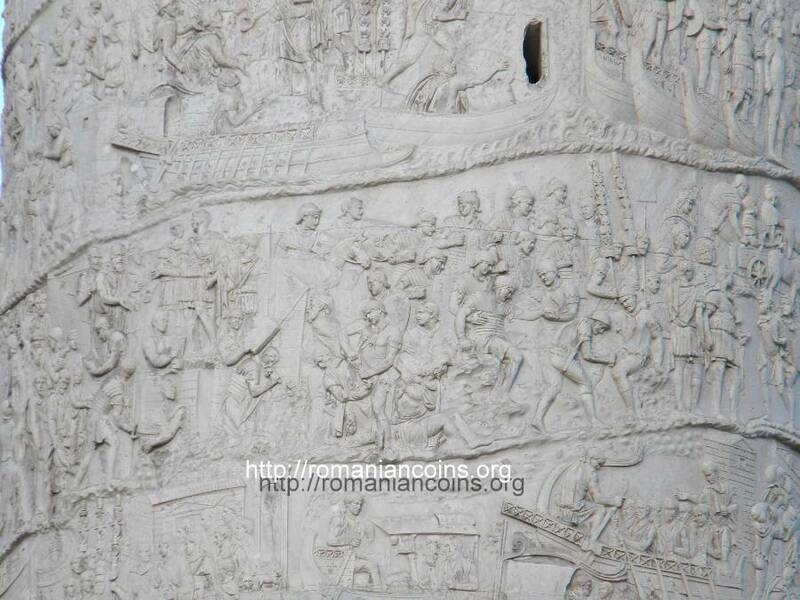 155 scenes depicting the two wars between Romans and Dacians are carved on the column's frieze. 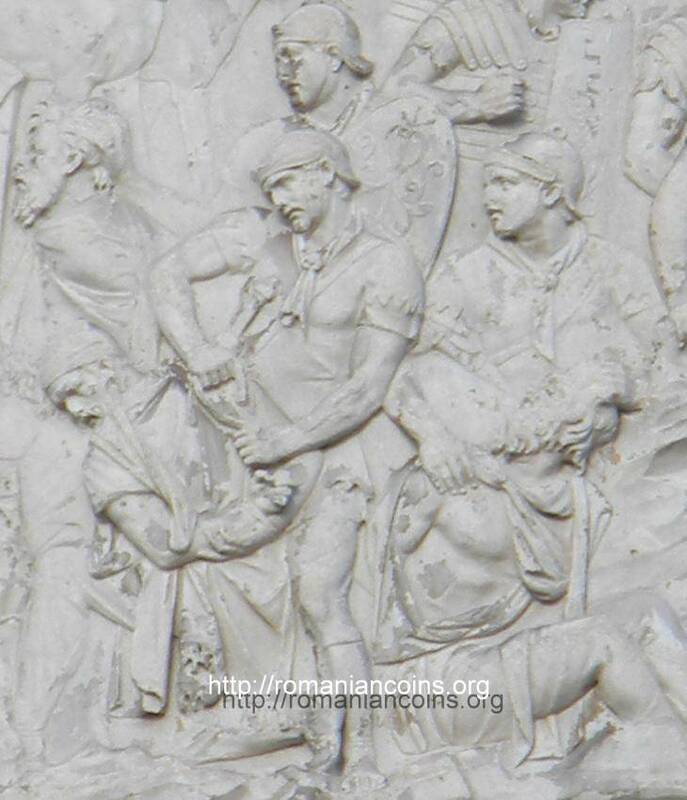 Over 2500 characters (emperor Trajan, Roman officers, junior officers and standard bearers, many legionaries, auxiliary soldiers - including Germans, that fought barechestedly, armed with clubs, Berber horsemen from Mauretania Caesariensis that did not use saddles and reins, sailors, king Decebalus, simple men and Dacian noblemen - tarabostes and comati, Sarmatian warriors allied with the Dacians, Dacian women and children, several gods etc.) 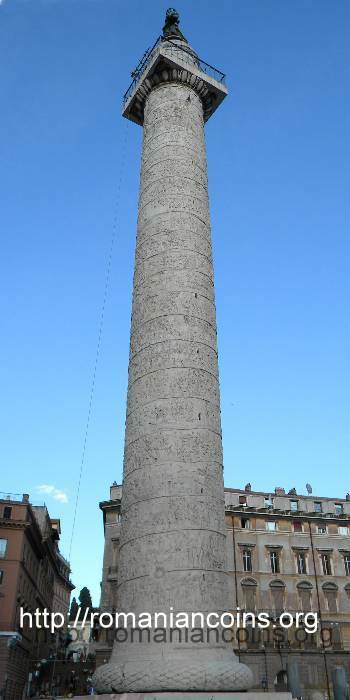 appear on the column. For example, below is shown a photo of some scenes on the Column, and several details with the scenes from the spiral number 6. 1. 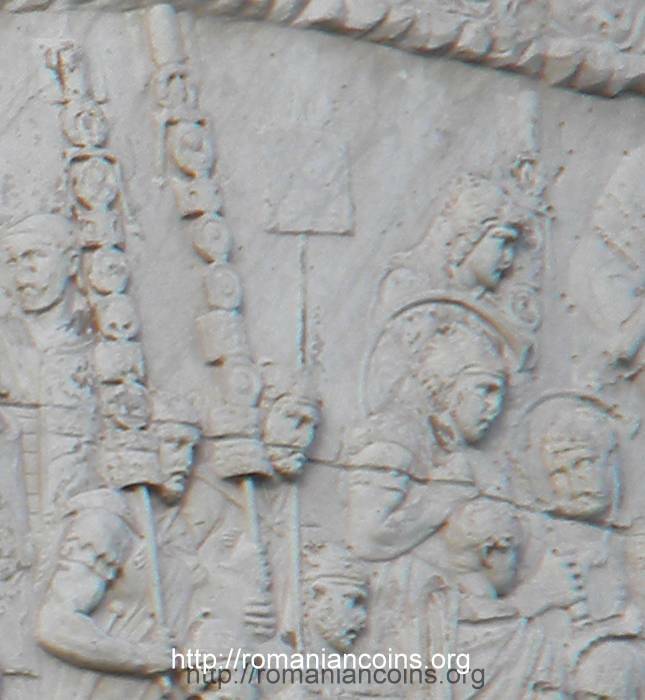 Daicoviciu C., Daicoviciu H., Columna lui Traian. Editura Meridiane, Bucureşti, 1966. 2. ***, Rome - Roma. La citta di Roma : turismo, foto, pianta, alberghi, storia antica ..., Colonna Traiana 2, retrieved January 2014. 3. 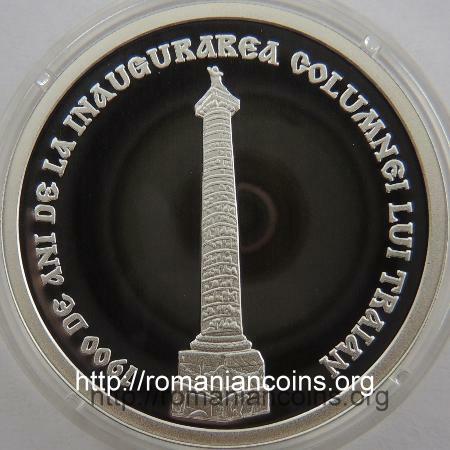 ***, Trajan's Column, Cartoon - Spiral Number 6, Panel C, retrieved January 2014. 4. 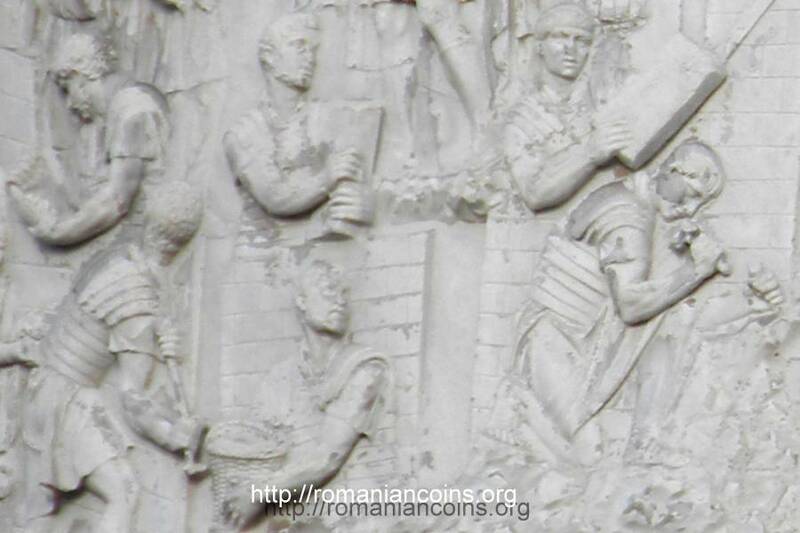 ***, Trajan's Column, Navigate the column, retrieved January 2014. 5. 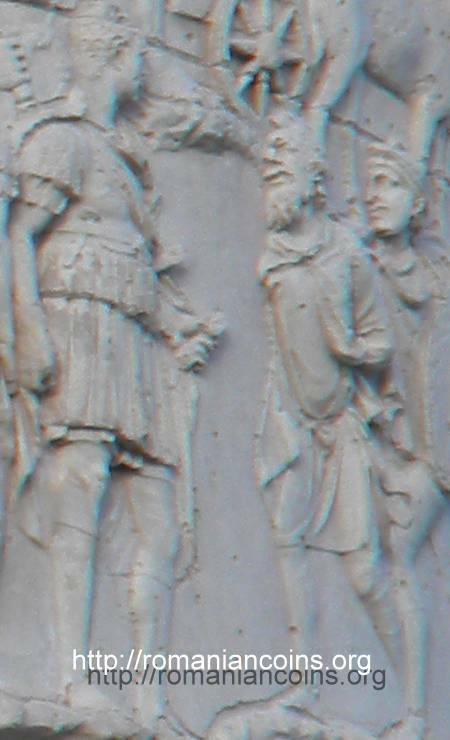 ***, Säule des Traianus, Säule des Traianus, sog. 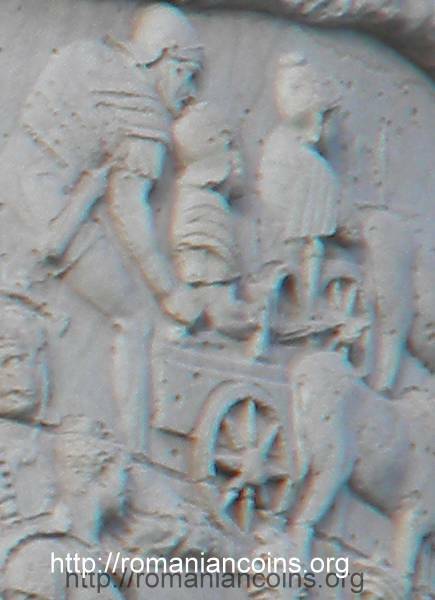 Trajanssäule, Säulenschaft - Scene 4, retrieved January 2014.